There are fly screens for side windows & the entry. The valve is of rescue boat quality. At the bottom there are several strong D-rings to help anchoring. The roof is totally waterproof. It is UV resistant & treated to be flame-retardant. 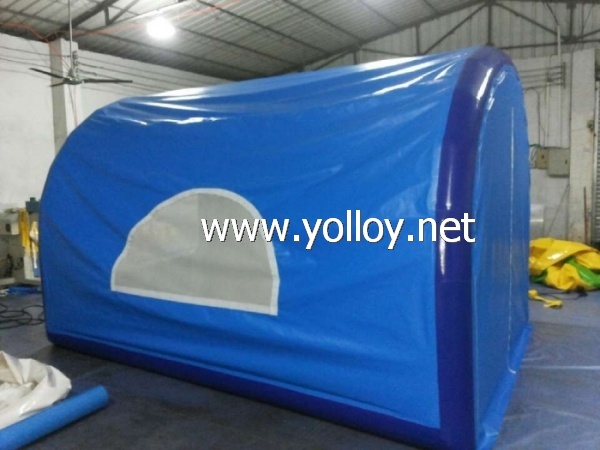 As you can see, this tent is a high quality product very suitable for outdoor use. The size makes this tent suitable for a group of 3 people – or even 4. It packs small enough to conveniently fit into a car. It is very easy to set up with the air pump – if you will have no grid power we can supply a Car DC12V Pump. This is a first choice for easy outdoor camping! The design can be customized, we are versatile and adaptable - colours, size, your own logo – please tell us your requirements, we will do our best to fulfil them for you.